Our presentation Committee does a great job hanging our exhibits every month. Volunteer at ArtCenter Manatee in downtown Bradenton! There are many opportunities to apply your talents. Whether you want to come every week or help with a special event: answer the phones and assist customers, help with a mailer, assist in a children’s class, apply your handyman skills, assist the librarian, hang a show, greet guests at an opening reception, serve on a special events committee… there are a number of positions which are sure to take advantage of your special skills and experiences, call us today at 941-746-2862 or fill out the volunteer form below! Front desk – if you have experience answering phones, entering data into a computer and love to talk to people, this is a great way to learn everything about the ArtCenter. You can choose a morning or afternoon shift once a week or as needed. Office – We often need people to help with mailers, enter data into the computer in one of the back offices, file and help with general office duties. The Hospitality Committee helps in the preparing and serving food for exhibits, bartending and cleanup. Special Events – Would you like to serve on a committee for one of our fun special events? This season, we will need help for Jazzy Ladies Fashion Show and Luncheon and our Fine Arts Festival. Receiving – Members of this committee check entries into all open and member exhibitions, collect payment for entries and inspect work to make sure it is suitable for entry. Receiving will be on select Saturday morning and early afternoons with volunteers normally staying just a couple of hours each. 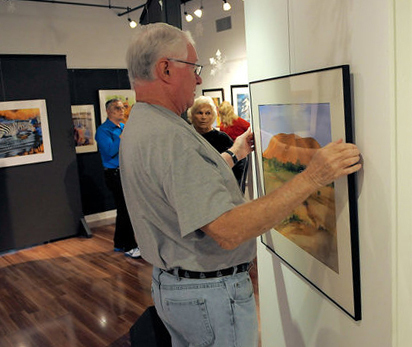 Presentation – This committee meets once a month to hang each exhibition at ArtCenter Manatee. It usually meets on a Monday from 9:00am to 2pm. Hospitality – This committee is indispensable at opening receptions once per month. They help set up the bar and tables, plate the hors d’oeuvres and make sure the serving trays stay full during the evening. Some on this committee are greeters at the door as guests arrive. Volunteers can choose to serve at one reception or come every month. 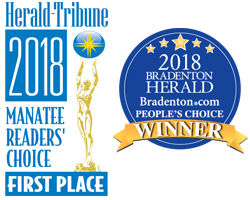 Building and maintenance – While we have a service which cleans ArtCenter Manatee, we often need someone who is handy with tools to fix things around the building, change light bulbs, clean the front windows, etc. Library – ArtCenter Manatee has a 3,000 volume art library. Our library volunteers check books back in and process all donated books. Be part of the excitement. Volunteer! Please fill out our volunteer Form! Do you have any special skills or work experience you would like to share?